1. How to export cards? Step 1: Go to the Advanced Search - click on the magnifying glass located on the Board header/Dashboard to open the tool. 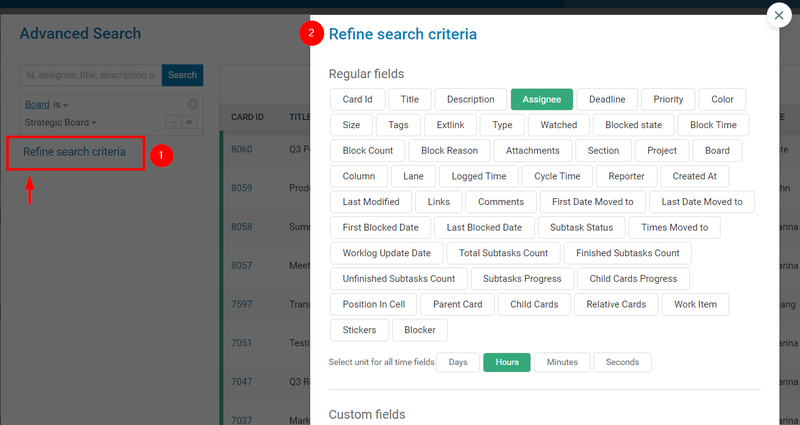 -> Select your search criteria (pills) in the Refine search panel. For example: if you want to export cards from a certain board, which are assigned to a particular user - > then you need to select two pills from the panel: Board (the last pill in the third row) and Assignee (the fourth pill in the first row) Img.2. The pills you have selected will instantly appear at the left side of the window -> set the values i.e. -> use the dropdown to define the Board name as well as the respective dropdown to set the User name. Then click on Search to run the report. The system will generate the matching results in a table format. Step 3: If you want to configure your search results i.e. 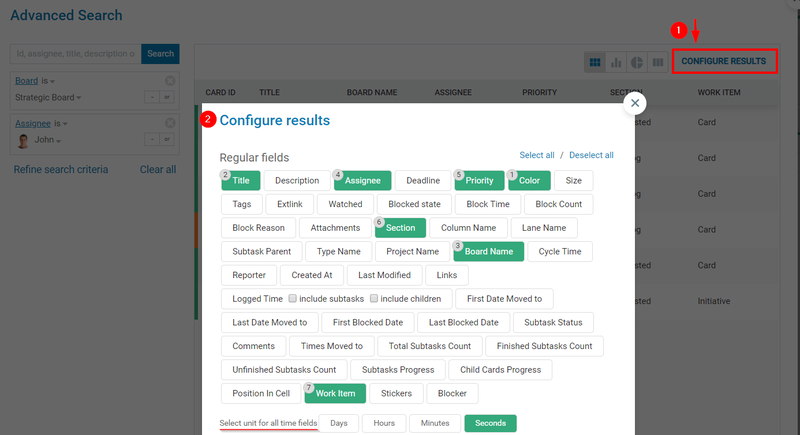 to show/hide properties, which are relevant to your report → select the "Configure results" (1) button at the upper right side of the panel (img.3). From the Configure results panel (2), you can select the data you need. You can also deselect fields, which you do not want to be present in your report. Every additional property will be represented by a new column in the initial report table. Note: Using the visualization options in the panel, you can choose to visualize the data from your search in a bar graph or as a pie chart. All options are available next to the "Configure results" link. Step 4: To export the final report, click on the Download icon at the bottom right corner of the Advanced Search panel. The system downloads your results and generates a link in the new "Download results" panel. Click on it to open and save the file on your device. Step 5: The information is exported to an Excel sheet, where the outcome fields (account properties) are aligned to match your excel columns. 2. Export cards from the Custom Widgets on your Dashboard. In case that you have set up custom widgets to monitor important information directly on your Dashboard, note that you can easily export the information from the widgets. 1. Go to the widget on your Main Dashboard. 2. Click on the Settings menu of the respective widget. 3. Click on Export and proceed accordingly. Read more to find out how to create a custom widget.